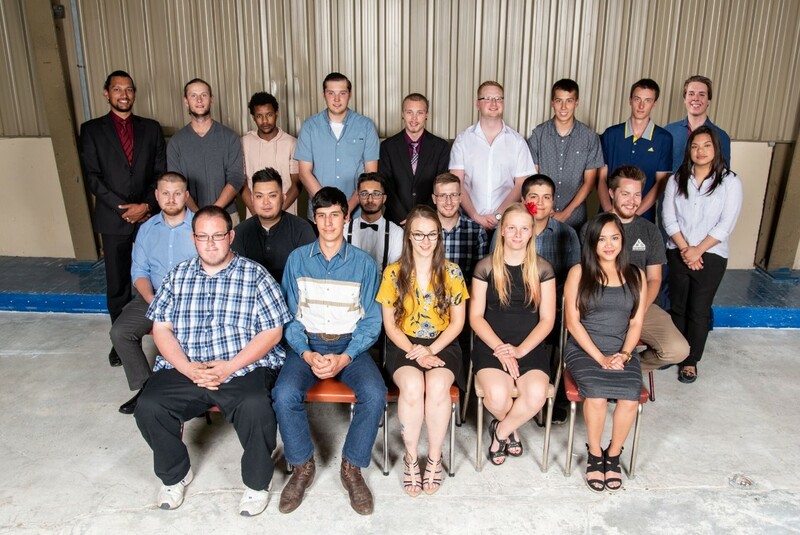 2018 Motor Vehicle Industry of Manitoba scholarship recipients.Seated front row: Brian Schollenberg (from left), Wyatt Nault, Ashley Weber, Pamela Buhler and Daren NuevoSeated second row: Brandon Majcher, Jaimar Mesina, Sukhbir Kensray, Alistair Friesen, Austin Ducroix and Dean WeissStanding back row: Paul Lewadny, Matthew James, Abel Shawl, Max Courchene, Brett Rudd, Christopher Maher, Darryl Merritt, Brett Metcalfe, Brayden Robb and Sophia Millen Bacani. On June 13, the Heather Curling Club was the venue for the 15th annual Motor Vehicle Industry of Manitoba (MVIM) scholarship evening. This year, there were 21 scholarships awarded to secondary and post-secondary students training to be automotive service technicians. The scholarships have been given out for the past 14 years — formerly under the aegis of the Red River Exhibition Foundation. Don and Joyce Sobering founded the scholarship program in 2002 in celebration of the 55th anniversary of their company, Sobering Automotive Centre Ltd. The scholarships reflect Don and Joyce’s ongoing commitment to the practice of apprenticeship training in Manitoba of highly skilled technicians for the motor vehicle industry. Manitoba Public Insurance came aboard in 2005, followed by the Manitoba Motor Dealers Association in 2006, the Manitoba Used Car Dealers in 2007, the Automotive Trades Association in 2012 and the Automotive Recyclers of Manitoba in 2014. MVIM introduced the Don and Joyce Sobering Family Scholarship in honour of the founders of the scholarship program in 2012. Repeat winners this year included Ashley Weber — for the fifth year in a row — Brian Schollenberg, Darryl Merritt and Brayden Robb. There is no limit to the number of times a student can apply. The scholarships are for $750 and $1,000. Ian Rogers, the scholarship committee chair, noted that Mac Tools doubles the amount of the scholarship for any recipients who come into a Mac Tools store with scholarship in hand. Rogers also pointed out the scholarship fund is administered by the Winnipeg Foundation. The scholarships are awarded from the interest earned on the principal, with a portion going toward the scholarships, a small amount is set aside for expenses and the remainder is reinvested with the Winnipeg Foundation. Copyright © 2017 Motor Vehicle Industry of Manitoba. All rights reserved.